Bank Of America has renewed the program for 2019 – see the updated details here. The Museums on Us program was introduced by Bank of America a few years back. If you have a BOA or Merril Lynch credit or debit card you are able to enter select museums the first weekend of every month for free. One free ticket for each cardmember. It is a great perk that can bring you $100-200 per year in value if you maximize it. The calendar has been updated to include dates in 2018…this is great news and an awesome perk! Here is a calendar of the dates for 2018. You can also find it on their website HERE. There is an interactive map that tells you which museums participate. This is an amazing perk that everyone should be able to take advantage of at one point or another. You can use this perk at your local museum, my son loves The Henry Ford Museum. Or use it when you travel, I loved visiting the American Museum of Natural History when we were in New York. I look forward to another visit or two to the Henry Ford this year as well as the Michigan Science Center. I may even need to visit the National World War I Museum and Memorial when I am in Kansas City this May. This is a great and inexpensive way you can spend some time with friends and family doing something different. Whether it is around the block or across the country there are a lot of possibilities worth checking out! Next articleHow Long Does The Aspire Free Night Take After Upgrading? None of the links for Museums on Us work, I have tried yours and the one on Bank of America and others on the web. please advise! The links work fine for me. I would guess you have a bad cookie. Try opening it incognito or clear your cookies first and try it again. Tysm for this article. I have a BofA cc and didn’t know about this! It is a really cool perk most people don’t know about. BOA doesn’t do a great job promoting it! Can children be admitted free on an adult’s card? Does this apply to BofA business cards too? I couldn’t find any definitive info on the Museums on Us site. Thanks. Christine it should since they just look at the BOA card and look for the BOA name. Does it function only with Bank of America card? Yes a BOA credit card or debit card works. There are only 2 museums on long island!!!!! 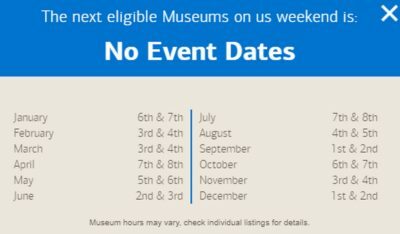 What about the other museums???? You have to plug in the zip code for the area you are interested in. That will pull up museums in the area that participate.